What is 'nothing'? What remains when you take all the matter away? Can empty space - a void - exist? 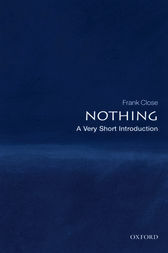 This Very Short Introduction explores the science and the history of the elusive void: from Aristotle who insisted that the vacuum was impossible, via the theories of Newton and Einstein, to our very latest discoveries and why they can tell us extraordinary things about the cosmos.Frank Close tells the story of how scientists have explored the elusive void, and the rich discoveries that they have made there. He takes the reader on a lively and accessible history through ancient ideas and cultural superstitions to the frontiers of current research. He describes how scientists discovered that the vacuum is filled with fields; how Newton, Mach, and Einstein grappled with the nature of space and time; and how the mysterious 'aether' that was long ago supposed to permeatethe void may now be making a comeback with the latest research into the 'Higgs field'.We now know that the vacuum is far from being empty - it seethes with virtual particles and antiparticles that erupt spontaneously into being, and it also may contain hidden dimensions that we were previously unaware of. These new discoveries may provide answers to some of cosmology's most fundamental questions: what lies outside the universe, and, if there was once nothing, then how did the universe begin?ABOUT THE SERIES: The Very Short Introductions series from Oxford University Press contains hundreds of titles in almost every subject area. These pocket-sized books are the perfect way to get ahead in a new subject quickly. Our expert authors combine facts, analysis, perspective, new ideas, and enthusiasm to make interesting and challenging topics highly readable. It covers very complicated concepts in a mostly accessible way. Frank Close, OBE, is Professor of Physics at Oxford University and a Fellow of Exeter College. He was formerly vice president of the British Association for Advancement of Science, Head of the Theoretical Physics Division at the Rutherford Appleton Laboratory, and Head of Communications and Public Education at CERN. He is the author of several books, including the best-selling Lucifer's Legacy (OUP, 2000), and was the winner of the Kelvin Medal of theInstitute of Physics for his 'outstanding contributions to the public understanding of physics'. His other books include Particle Physics: A Very Short Introduction (2004), The Cosmic Onion (1983), The Particle Explosion (1987), End (1988), Too Hot to Handle (1991), and The Particle Odyssey (OUP, 2002). In 2013Professor Close was awarded the Royal Society Michael Faraday Prize for communicating science.